Stig, long time baker from the start of Bethesdabakin’, was in touch to say that her daughter, Eve, had a part in the BBC’s Lady Chatterley’s Lover broadcast last Sunday. Eve seems to be on the way to being a successful actor – she is also in Ibsen’s Little Eyolf at London’s Almeida Theatre from mid-November. 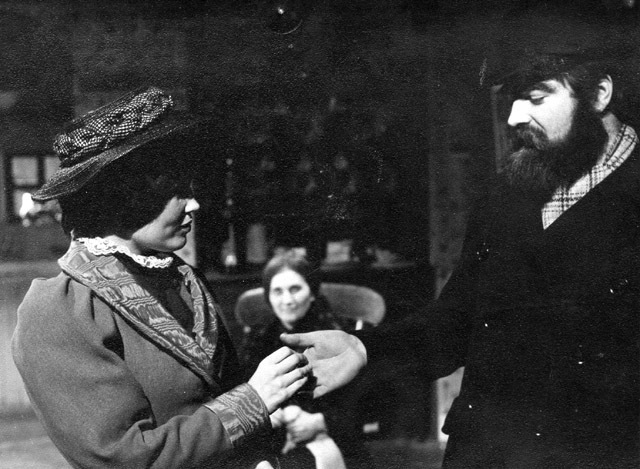 Yes, it’s yours truly treading the boards at Dundee Repertory Theatre circa 1970 in Laurence’s The Daughter In Law. I had a walk-on as a cab driver and had to say “half a crown”. It was very onerous. But one of the lead actors said it was as if Laurence himself had walked on stage …. I think Eve has a brighter acting future than mine – she’s in trouble if she hasn’t! Was that DH or Olivier who walked on stage? ?